Approximately half the students in the TASIS High School each year are non-native English speakers, but many take International Baccalaureate (IB) exams in English and excel. In particular, their performance on the IB English B Higher Level (HL) exam in recent years has been exemplary. In 2016, 38 non-native English speakers took the exam, and 35 of them (92 percent) scored a 6 or 7. (All individuals IB exams are scored from 1–7.) Credit IB English B teachers Carolyn Heard, Tamara Schumacher, and Andra Yount as well as the entire English as an Additional Language (EAL) team for these remarkable results. We caught up with Ms. Heard—who has chaired the EAL Department since coming to TASIS in 2000 and was the recipient of the School’s inaugural Khan-Page Master Teacher Award in 2009—and asked her about the strong IB exam results and the TASIS EAL Department, which in 2015–2016 was composed of faculty members Stephanie Roth, Hope Schlict, Schumacher, Holly Wiens, and Yount at the High School level; Gigi Diane Guarnieri Rosso, Sonia Maczeakova, Dr. Kelly Merritt, Julie Plantecoste, Perri Sartorelli, and Holly Shepherd at the Middle School level; and Kent Hercules, Dr. Ilaria Peltier, Eleonora Pinton-Capponi, and Alice Rourke at the Elementary School level. How does the EAL curriculum help prepare students for IB exams? Part of the reason why the IB English B results have been rather good over the years has to do with the strong EAL program we have at TASIS. Not all our students come to the IB having taken their previous EAL courses here, but for those who have, I like to think that everything they have studied and accomplished in the preceding levels has enabled them to do well in our two-year IB English B course. The curricula of those earlier courses are designed in such a way as to give the best possible preparation for IB English B, or for any other English course, for that matter. As a department, we do tweak the curriculum, but of course only with the aim of improving it, of making sure it is as up-to-date and stimulating as possible, and always with the ultimate goal in mind—readiness for university and professional life. In addition to the grammar, literature, writing, and topic-driven components of IB English B, there is also the teaching of “text types,” which occurs primarily during the first three semesters. Students learn to write such things as proposals, newspaper articles, formal and informal letters, and brochures. Here the students combine expository writing techniques with elements of creative writing. This kind of writing is often tied to the literature they are reading. Students get frequent opportunities to practice these tasks, which is good not only for the development of their general writing and thinking skills, but also because mastery of these text types is tested in the written exams. How do you prepare your IB English B students for their IB exams? IB English B is a two-year course. In Year One, students get a good dose of sentence analysis—examining the components of the simple, compound, and complex English sentence—which gives them the tools they need to read with enhanced comprehension and to write more effectively. At the same time, they get coached on correcting grammatical and syntactical errors as well as on improving their organization and argumentation. As the course progresses, they reflect upon the fundamentals of expository writing and are introduced to, and given opportunities to practice themselves, a good number of the text types they will have to know when exam time comes. The novels assigned for this first year of the course provide a framework for two of the IB-prescribed topics: Cultural Diversity and Customs & Traditions. In addition, there are units on Logical Fallacies and Advertising Techniques, both of which tie into the IB-prescribed topic of Media & Communication. We discuss all of these things as a class and in small groups, and there are quizzes and tests that measure their comprehension and achievement in these areas as well as assigned written work and rewrites. The students also get many chances to familiarize themselves with the IB exam format by practicing with past exams, particularly Paper One, during the first year of IB English B; in addition, they get a practice go at something called “The Written Assignment,” which is part of the assessment in Year Two. In Year Two, we continue with the learning of text types, the discussion of the literary works read, the taking of practice exams, the correcting of errors, and the editing of written work. The finer points of grammar and writing are taught in order to improve spoken and written expression further. The two IB-prescribed topics that are the focus of much of the discussion that takes place in Year Two, Media & Communication and Science & Technology, are tied to the literature assigned. Enhancing students’ understanding of the first topic is a review of logical fallacies, during which they study and discuss how lapses in reasoning, often quite deliberate but frequently convincing, play a role in political propaganda. The theme of Science & Technology provides a framework for many discussions on the advances made in these areas and how such advances affect various aspects of human life. These discussions, in turn, serve as inspiration for various written tasks as well as for the externally assessed Written Assignment. During the latter half of Year Two, students also discuss other IB English B-prescribed topics in the interest of furthering their preparation for the IB English B Oral Assessments. One component of the course that students find particularly helpful has to do with the work we do vis-à-vis error analysis and logical thinking. I tell them that good writing is clear, cogent thinking on paper and that they must keep their readers glued. This will not happen if their work is riddled with careless, distracting errors, dull, unnecessary repetition, or leaps in organization and logic. Thus, I encourage them to point out murky or fuzzy thinking when they assess each other’s work and to find ways of rectifying flaws in written expression and/or basic logic. How do you assuage students’ fears and nerves as the exam approaches? When students ask me about the IB exams and display apprehension, I reassure them in a number of ways. First, I tell them that they are competing against students all over the world, many of whom have not had the privilege of having been schooled in English. Next, I tell them that I will do all I can to make them feel comfortable when taking their IB English B Orals and that I will provide plenty of input and practice for them with regard to the reading and writing components of the assessments in Year Two. Moreover, I remind the students that for the IB examiner, grammatical accuracy is not as important as imparting the message clearly—so although Ms. Heard may be a stickler for correct usage when it comes to grammar, spelling, and syntax, the IB is less so. Finally, as the exam approaches, I guide the students in a thorough review of the key guidelines and principles of writing they need to keep in mind as they write on that important day. Doing these things generally reassures them quite a bit. Of course, throughout the two years of IB English B, I frequently remind the students that doing steady yeoman’s work, asking questions, and keeping up as we go along, is the most effective way of preparing for and feeling confident about getting through the IB English B assessments process. When you teach, do you focus more on the exam or knowledge? "I want them to leave TASIS fully equipped in terms of their academic language-handling abilities to do well not only in any future English course they may take, but in all of the coursework they do, as competence at reading, speaking, listening and writing is crucial to success at the university level." My focus is on improving their academic English skills, along with critical thinking skills, to the point where the students will feel confident going to an English-speaking college or university. I want them to leave TASIS fully equipped in terms of their academic language-handling abilities to do well not only in any future English course they may take, but in all of the coursework they do, as competence at reading, speaking, listening and writing is crucial to success at the university level. Obviously, I keep the goals of the IB English B assessments in mind, and do inculcate an awareness of those goals in the students as the course progresses throughout the two-year program, but for university-bound students, ultimately I consider success—ideally a 6 or a 7—on the IB English B exams as secondary to mastering the course content. If I were left to my own devices and didn’t have to keep in mind the demands of the IB English B exams, the course content would be different; I’d probably focus more on literature and less on some of the topics prescribed, but as it is, I’m actually very happy with what the IB wants its English B teachers to do, as I have the chance to cover topics I normally wouldn’t teach that are extremely useful to the students, not only in terms of the development of their vocabulary, reading, and writing skills, but also with regard to their general awareness of important issues in today’s world. The IB English B curriculum includes three mandatory topics: Media & Communication, Social Relationships, and Global Issues. It also has five optional topics, of which I focus on Science & Technology, Customs & Traditions, and Cultural Diversity. Finding resources on these topics and blending them into the rest of the course content—e.g. expository writing, vocabulary development, and the teaching of text types, to name a few—and seeing how the students respond to them is a particularly stimulating part of my job. Thus, my major focus is on helping students build a general skill set throughout the two years and strengthening their proficiency as much as possible with regard to listening, reading, speaking, and expository writing in English. The exams, of course, show how a given student performs on a particular day on a particular set of tasks designed to determine the degree of his or her strength in various areas of the IB English B curriculum. The students of course want, and need, to do well on these exams, and so in Year Two, as the exam date draws near, the focus becomes more and more exam-oriented. That being said, I would still say that my greatest desire and overarching goal is to prepare my students for university as well as for their professional and personal lives thereafter, wherever and whenever they find themselves in a situation where they will have to communicate effectively in English. How they do on the day of the IB English B exam takes a back seat to that. The most valuable tool a teacher can have, from my perspective, is an absolute belief in the value of what he or she is teaching. I have that in spades. Sometimes, however, it can result in getting overly zealous! In IB English B, there is so much to cover and so much to do in an extremely limited amount of time, which means I am forced to make some very painful choices. But I believe very strongly in the value of what I am doing, and that every student, even the ones whose abilities in this area are limited, will benefit in significant ways. This conviction—along with the desire to follow through on it—drives everything that I do for my students. Do you ever hear from your EAL students after they’ve moved on from TASIS? I occasionally hear back from students who have won awards in English at their post-TASIS schools or others who have written from university to thank me because they have either been excused from the mandatory freshman English courses or else they have been congratulated by their English professors on their solid writing skills—as EAL speakers! This kind of feedback has most certainly been the most meaningful to me of any feedback I’ve ever received. It confirms my conviction that what I am doing is truly worthwhile, and it makes me very happy to know that something I’ve done has been of direct benefit to so many individuals. Fifty-six of 57 candidates (98 percent) passed their exams and earned an IB Diploma, marking the fourth consecutive year that TASIS students have passed at a rate of 97 percent or higher. The pass rate worldwide has remained below 81 percent over this same period. The 56 IB Diplomas represent a new high for TASIS. The highest overall score for an IB Diploma candidate was 41, and the average score was 31.4 (compared to a worldwide average of 30.2). Ninety-four students took a total of 372 individual IB exams, which are scored on a scale of 1–7, and posted scores of 4 or above 89 percent of the time, 5 or above 65 percent of the time, and 6 or above 37 percent of the time. There were 16 different subject exams in which at least one TASIS student earned the best possible grade of 7—and 33 sevens in all. The overall average for all scores was 5.0, compared to a worldwide average of 4.7. A total of 94 students took at least one IB exam, which establishes a new School record and places TASIS in the top 25 percent of IB Diploma Programs worldwide (ranked by size). TASIS also set a new School mark with 507 subject registrations, which include Extended Essays and the Theory of Knowledge course as well as the subject exams. Thirty-five TASIS candidates earned an International Baccalaureate Bilingual Diploma—meaning their first language (Language A) is not English or their Extended Essay was not written in English—for a Bilingual Diploma rate of 63 percent. This represents the seventh time in the past eight years that the School has topped the 60 percent mark while the worldwide rate has hovered between 28-31 percent over the same period. A further testament to TASIS students’ impressive language skills: of the 45 students who took IB exams for Italian B (HL and SL taught by Geraldine Caussette and Florence Kofler, respectively), French B (also Caussette and Kofler), or Spanish B (HL and SL taught by Nilda Lucchini and Angel Alvarez), a remarkable 36 scored a 6 or 7. An additional eight students self-studied for IB language exams in Albanian, Chinese, Lithuanian, Serbian, or Turkish, and they posted an average score of 6.25. Science IB students posted excellent scores for the second straight year, besting the world average in Biology SL by 1.06 points (taught by Amy Bloodworth), in Chemistry HL by 0.62 points (Alec Ogilvie), in Physics SL by 0.45 points (Matt Walker), and in Biology HL by 0.10 points (Dr. Jill Price). Peter Locke’s English A: Language and Literature HL students posted an average score of 5.80—0.74 points above the world average. Dr. Chris Love’s English A: Literature HL students averaged a 5.60—0.80 points above the world average—and his English A: Literature SL students averaged a 5.33, exceeding the world average by 0.33 points. Ten students took the IB 20th Century World History HL exam and posted an average score of 5.00—0.85 points better than the world average—and 21 took the SL exam and averaged 4.86, 0.18 points above the world average. Brody Fredericksen taught both levels. Three IB Diploma candidates—Carmen Alban, Paulina Gazin, and Edoardo Italia—scored at least 40 points, a feat accomplished by just seven percent of candidates worldwide. 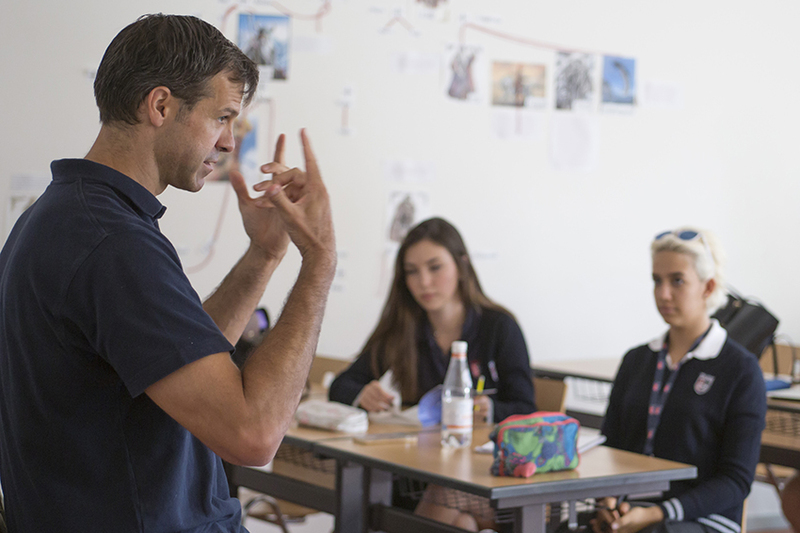 Click here to learn more about the differences between the International Baccalaureate and Advanced Placement programs at TASIS and to read about results prior to 2016.